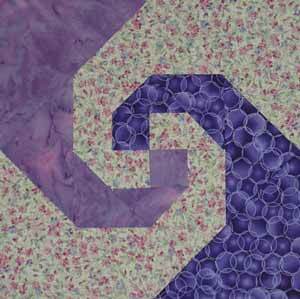 The spiral effect that is achieved with this block makes a very interesting quilt. 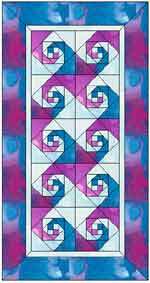 Try one light fabric, adding a medium and a dark making sure there is enough contrast between the fabrics so you do not lose the spiral. Try doing a gradation of four colors in different tones for a completely different effect. 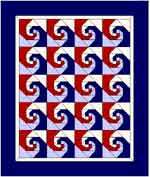 Look at the examples of the quilts and you will see one where every other block is flipped so the spiral goes in both directions. B 2 Light Cut one 3" x 3" square. Cut in half diagonally once. C 2 Light Cut one 3 7/8" x 3 7/8"square. Cut in half diagonally once. D 2 Light Cut one 5 1/8" x 5 1/8" square. Cut in half diagonally once. 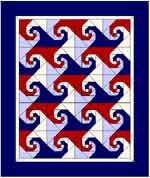 E 2 Light Cut one 6 7/8" x 6 7/8" square. Cut in half diagonally once. F 1 Medium Cut one 2" x 2" square. G 1 Medium Cut one 3" x 3" square. Cut in half diagonally once. H 1 Medium Cut one 3 7/8" x 3 7/8" square. Cut in half diagonally once. I 1 Medium Cut one 5 1/8" x 5 1/8" square. Cut in half diagonally once. J 1 Medium Cut one 6 7/8" x 6 7/8" square. Cut in half diagonally once. K 1 Light Cut one 2" x 2" square. L 1 Dark Cut one 3" x 3" square. Cut in half diagonally once. M 1 Dark Cut one 3 7/8" x 3 7/8" square. Cut in half diagonally once. N 1 Dark Cut one 5 1/8" x 5 1/8" square. Cut in half diagonally once. O 1 Dark Cut one 6 7/8" x 6 7/8" square. Cut in half diagonally once. Step 1:	Sew one A square to the K square and the other A square to the F square. Press seams toward darker fabric. Step 2:	Sew A/K to A/F to make a Four Patch Unit. See diagram. Press seam to one side or open. Step 3:	First Round: You are starting the spiral. Sew Triangle G to the A/F side of the Four Patch Unit. See diagram. 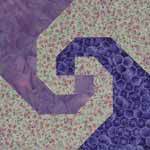 Press seam toward triangle G. Note: G and F are from the medium fabric. They must be next to one another. Step 4:	Sew a Triangle B to the adjacent side of the Four Patch Unit. Press seam toward triangle B. Note: Make sure B is next to one of the A squares. Step 5:	Sew Triangle L to the adjacent side of the Four patch Unit. Press seam toward Triangle L.
Step 6:	Sew the other Triangle B to the last side of the Four Patch Unit. Press seam toward Triangle B. This is the Main Unit. Step 7:	Second Round: Sew Triangle H to one side of the Main Unit next to Triangle G of the same color fabric. Press seam toward Triangle H.
Step 8:	Continue Second round as First Round with Triangles C, M, and C, making sure that the triangle that you are sewing onto the Main Unit is next to the same color fabric triangle in the First Round. That makes the spiral effect. Step 9:	Third Round: Add Triangles I, D, N, D as in Second Round. Step 10:	Fourth Round: Continue as Third Round adding Triangles J, E. O, and E.